The beautiful Gateway outdoor bench is in an elegant class of its own. 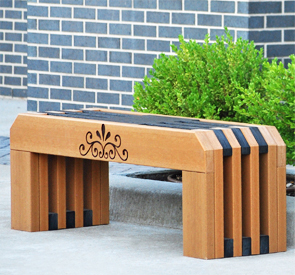 Rich cedar slats alternated with sleek black slats create a eye-catching contrast on the recycled plastic outdoor bench. The front cedar plank of the bench can feature an optional black etched design to add a beautiful, charming accent. 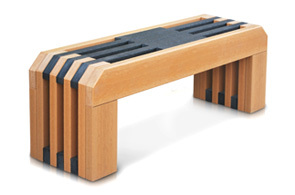 The unique bench also features functional and stylish open slots allowing for more air to flow through the bench slats minimizing movement, maximizing stability, and enhancing the style. Gateway Outdoor Bench comes standard with cedar and black slats. Custom color options are available for orders of 20 or more. Please call for more information on custom orders, and we'll be happy to assist. The recycled plastic planks are virtually maintenance-free - they do	not need to be sealed, painted or stained. UV protection ensures they will stay beautiful, much longer than wood. Pens and markers can easily be washed off, and paint will not bond to the surface and can be removed with sandpaper. Surface cuts or scratches can simply be ironed away. The sheer weight of the Gateway outdoor bench serve as an excellent theft deterrent, but optional in-ground mount and surface mount kits are available for securing to any surface such as concrete or dirt. Optional Decorative Etch Design decorative feature etched in at no addtional cost.